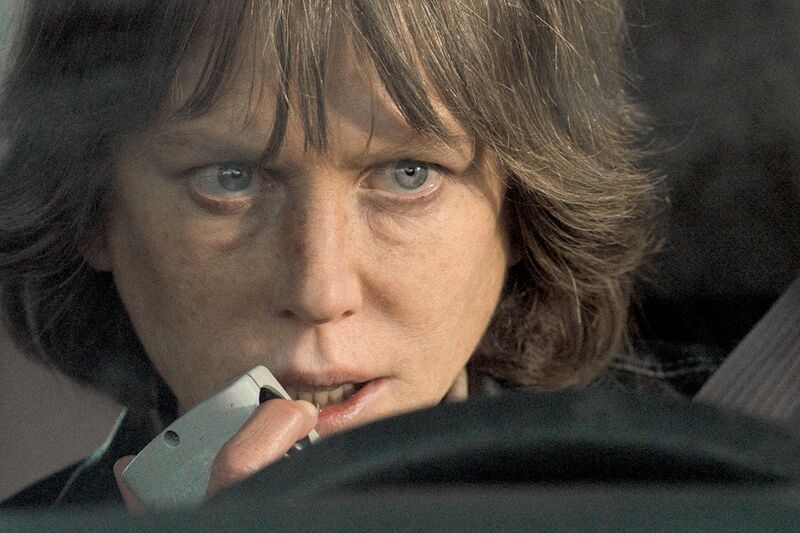 Imagine You’ve Got Mail-era Meg Ryan bitten by a zombie, and you have some idea what Nicole Kidman looks like in Destroyer. You also get a sense of the rather narrow range of her performance — she plays haunted, hollowed-out L.A. detective Erin Bell, staggering from barroom to crime scene and back again, detouring occasionally to have a desultory quarrel with her ex-husband (Scoot McNairy) and daughter (Jade Pettyjohn), who’s acting out in order to attract mom’s attention. You wish the kid well. Erin is nominally alive, but her spirit is dead, consequence of her role in problematic investigation some years back. We see glimpses of it in the flashbacks that director Karyn Kusama folds into the murder investigation that frames the movie. There’s a dead body in a culvert; Erin thinks she knows who might be responsible and launches her own off-the-books (and extra-constitutional) investigation. At the same time, she gets word that a sinister figure from her past (Toby Kebbell) has resurfaced, someone who’ll force her to remember everything she’s trying to forget, and also to account for missing evidence that still, all these years later, has the power to incriminate and destroy. Much rides here on Kidman’s ability to convey her character’s interior struggle, and she comes up a little short. Her Erin is whittled down by guilt, grief, and regret, and the whittling too often leaves a woman that is simply wooden. Which is too bad, because Kidman is playing an archetype that women rarely get to play — the soured, disillusioned detective who’s become detached from any meaningful moral or legal framework, a rogue figure capable of good or ill in equal measure. A loner, like Dirty Harry, except that Kusama tunes her movie to the way a woman would experience this gritty, noir-ish world, and Erin does things (in a scene with Wind River’s James Jordan) that are outside Dirty Harry’s skill set. Too bad Kusama couldn’t apply shock paddles to Kidman, because everything else about the movie is really pretty good — especially for fans of hard-boiled cop movies. The story circles cleverly back on itself, putting an original spin on the familiar tale of the burned-out investigator reckoning with the defining event in a checkered career. There is solid support from Sebastian Stan as Erin’s former partner, and Shamier Anderson as her sidelined current one. There’s also Orphan Black’s Tatiana Maslany, so good in Stronger, this time as a woman with knowledge of Erin’s past, and perhaps a premonition of her future. Mostly though, there’s Kidman, and even though it’s not one of her better performances, it’s worth noting the eye-popping diversity of Kidman performances aggregating movies currently in theaters. Rogue cop in Destroyer, prim and bespectacled gal Friday in The Upside, and amphibious Queen of Atlantis in Aquaman — the latter role perhaps explaining why Erin does not drown in booze. Directed by Karyn Kusama. With Nicole Kidman, Tony Kebbell, Sebastian Stan, Scoot McNairy, Jade Pettyjohn, Shamier Anderson and Tatiana Maslany. Distributed by Mirror.